Holland’s Custom Cabinets began in 1977, and while its decades of quality workmanship had built a reputation of having the best designers and craftsmen in the market, its brand did not reflect that prestigious image. Holland’s Custom Cabinets approached us to rebrand their custom cabinet company to reflect their quality products and services—and we did just that. Holland’s Custom Cabinets needed a first-rate brand to match its premium products and services. We achieved this through the careful choice of colors, along with an eye towards branding elements that would portray the company as the top choice in its market. We reflected the company’s superior craftsmanship in the brand image, through an upscale font in a rich color palette of chocolate brown and tan. The contemporary icon features the same warm colors, with a stylized “H” that features a custom cabinet door. We showcased the new brand identity on vehicle wraps for the company’s fleet through a simple, but elegant design. The fresh look allows the new brand to be a traveling billboard for the company’s high-quality solutions. The luxurious, but modern, color palette was also extended to the company’s website, where stunning images of the company’s work take center stage in an organic design that uses curves and circles to create a comforting feel. 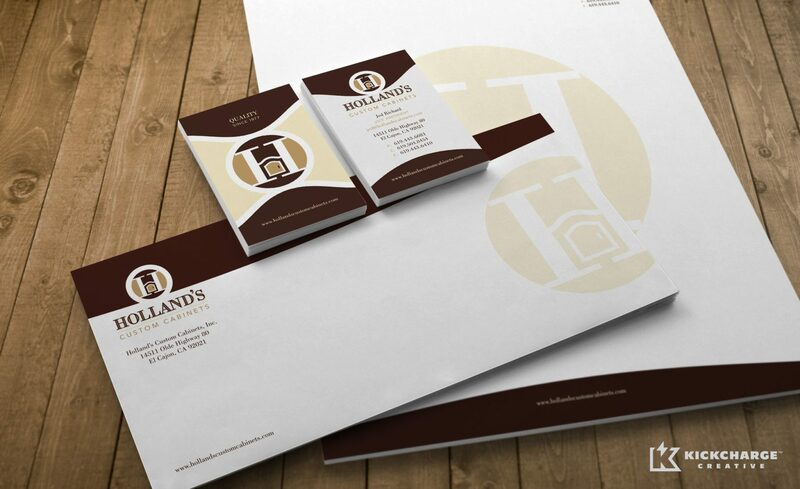 Finally, we also integrated the new brand on the company’s stationery, which completed the rebranding transformation. 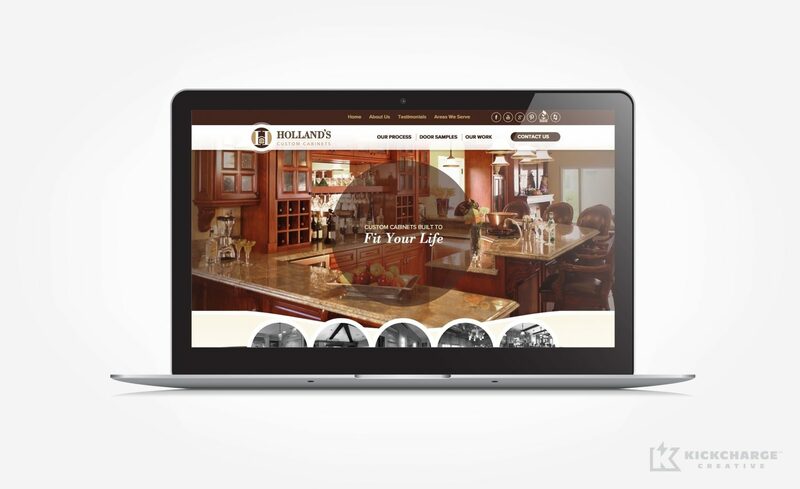 The amazing work of Holland’s Custom Cabinets inspired us to transform its brand into something that looked as good online and on paper as its products do in homes across California. With a renovated brand identity that accurately portrays the company’s second-to-none artistry, the company was able to build a fresh start for the future. 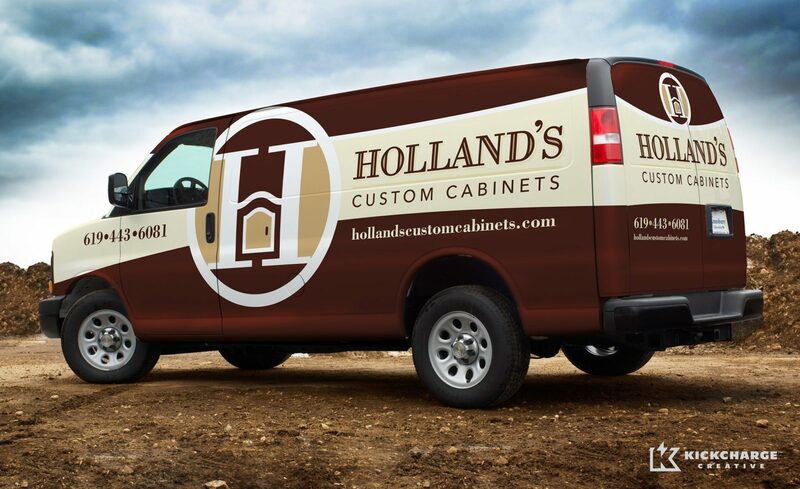 Holland’s Custom Cabinets’ annual sales increased by 45% after launching the new brand across their stationery, advertising, website, and vehicle wrap. In addition, within just one year of rebranding the company and redesigning their website, they gain 25 new leads per week, on average, from their website and their total website traffic was increased by 104%.